Perhaps into a warm mug of mulled cider. Or would that be too much apple cider, or is there even such a thing as too much apple cider? Apple cider, another seasonal favorite of mine. Thick, and super sweet, served ice cold or piping hot, it wouldn’t be Autumn without it. Naturally when a fellow blogger asked if I would contribute some autumn inspired recipes for her blog, apples immediately came to mind. So far part one of my contribution, I set myself to work developing a recipe for gluten free donuts. 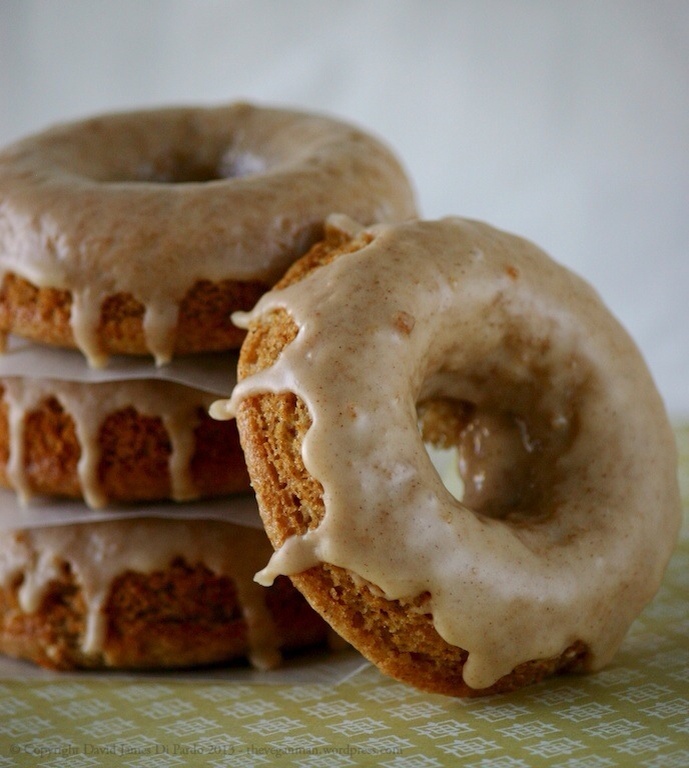 Apple cider was a perfect pairing for these tender, fluffy donuts with just a hint of spice. For those of you, who are new to the world of baked donuts, be forewarned. These are dangerous waters to be treading. after one batch you’ll be looking for all the other flavors you can throw into these. I’ve developed about a dozen recipes to date, and have only scratched the surface. While they are lighter, and far healthier than their fried counterparts, these are still worthy of the “comfort food” label. My challenge of course was making these gluten-free. Gluten sensitivities seem to be spreading like wild fire these days, or perhaps it’s just people awareness of it. None the less, this was definitely un-ventured territory. Curious as I was to see how well these would hold together with the absence of both gluten and xanthium gum (a popular additive in gluten-free baking) I wasn’t without reservations. If every gluten-free recipe I’ve seen called for the additional of this pricey gum, certainly there must be a reason for it. but stubborn as I am, I pushed forward and ditched it. Much to my surprise these turned out great and had an extremely similar if not identical texture to their gluten laden cousins. You would never guess they were gluten-free, or vegan for that matter. So to confirm my findings I sent a box over to my spouse’s office for taste testing where they sat alongside their oil soaked namesakes from a local donut shop. The results; they were devoured in minutes, while the grease buckets ended up in the trash. After all, who can resist fresh made donuts?? So, if like us, you buy apple cider by the gallon this time of year and are looking for something to do with it (other than drinking it that is), give these a try. I think you’ll be amazed at how delicious baked donuts can be. You can find the recipe here, on Jennifer’s blog along without lots of other seasonal recipes and tips.